Used with ash or sand to hold stick, cone or coil incense. Incense resins, aromatic wood-chips or kneaded incense can be enjoyed with ash and a burning charcoal. Traditional 3-leg design. 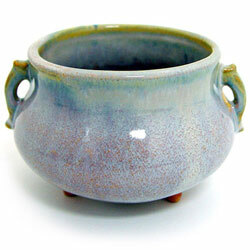 Handmade by skilled U.S. potters.